Nationwide, debtors filed 773,375 bankruptcy petitions in 2018, 2 percent fewer than in 2017. This was the lowest total since 2007, which was the first full fiscal year after the Bankruptcy Abuse Prevention and Consumer Protection Act of 2005 took effect. Nonbusiness (i.e., largely consumer) petitions, which accounted for approximately 97 percent of all petitions, dropped 2 percent to 751,272. Business petitions, which amounted to 3 percent of all petitions, fell 4 percent to 22,103. Bankruptcy petitions may be filed under one of six chapters of the Bankruptcy Code. Most consumer petitions were filed under chapter 7 or under chapter 13. Most business petitions were filed under chapter 7 or under chapter 11. Filings under chapter 7 fell 2 percent to 477,248 and constituted 62 percent of all cases filed. Nonbusiness chapter 7 filings, which accounted for 97 percent of all chapter 7 cases filed, also fell 2 percent and amounted to 62 percent of all nonbusiness filings. Business chapter 7 petitions decreased 5 percent and constituted 62 percent of all business cases filed. These proportions changed little from 2017. Cases filed under chapter 13 declined 3 percent to 288,550. These petitions equaled 37 percent of all filings. Nonbusiness chapter 13 petitions also declined 3 percent, dropping to 286,654 and amounting to 38 percent of all nonbusiness petitions. Business chapter 13 petitions decreased 10 percent from 2017 and represented 9 percent of all business cases filed, the same as in 2017. Chapter 11 filings held relatively steady, dropping less than 1 percent to 7,014. Chapter 11 cases, which typically require significantly more court resources than cases filed under chapter 7 or chapter 13, accounted for less than 1 percent of all filings. The 5,962 business chapter 11 petitions amounted to 27 percent of all business cases filed, 1 percent more than 2017. The three remaining chapters of the Bankruptcy Code—chapter 9, chapter 12, and chapter 15—collectively accounted for less than 1 percent of all petitions filed. 1 "Other" includes cases filed under chapters 9, 12, and 15 of the bankruptcy code. 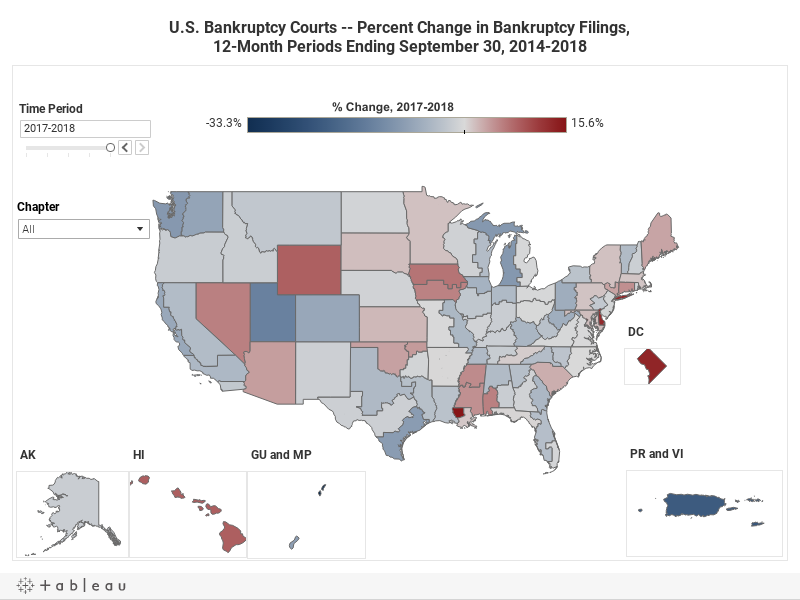 Although bankruptcy filings decreased nationwide, the number of bankruptcy cases filed increased in two circuits: the District of Columbia Circuit (up 14 percent) and the Second Circuit (up 6 percent). Ten circuits had reductions in cases filed. Districts constituting the First Circuit had a combined drop in filings of 8 percent, and the districts in the Tenth Circuit saw cases filed decline 5 percent. The federal Judiciary has 90 bankruptcy courts, one in each judicial district except for the Districts of Guam, the Northern Mariana Islands, and the U.S. Virgin Islands (where bankruptcy cases are heard by a district court judge or a visiting bankruptcy judge) and the Eastern and Western Districts of Arkansas (which share a bankruptcy court). In 2018, 60 of the 90 bankruptcy courts reported fewer filings compared with the previous year. Of the 30 bankruptcy courts that registered increases in cases filed, the Eastern District of New York had the largest, a rise of 1,904 cases (13 percent higher than in 2017), which was attributed to a significant jump in pro se debtor cases filed. The number of bankruptcy cases terminated fell 5 percent to 816,006. As terminations outpaced filings, pending cases dropped 4 percent to 1,027,477. For data on activity in the U.S. bankruptcy courts, see the F series of tables. Chapter 7 Provides that non-exempt assets be liquidated and proceeds distributed to creditors. Covers local governments and instrumentalities. Allows businesses to reorganize and continue operating. Also available to individuals whose debts exceed statutory limits for filing under chapter 13. Covers family farmers and fishermen. Provides that debtors with regular income retain assets and obtain court-confirmed plans to pay off their creditors. Applies to foreign corporations and individuals. Adversary proceedings are separate civil lawsuits that arise in bankruptcy cases, including actions to object to or revoke discharges, to obtain injunctions or other equitable relief, and to determine the dischargeability of debt. Adversary proceedings may be associated with consumer bankruptcy cases, but more commonly arise in cases filed under chapter 11. Because of time limits imposed by Section 546 of the bankruptcy code, the number of adversary proceedings filed usually is related to the number of chapter 11 cases filed two years earlier. In 2018, filings of adversary proceedings declined 13 percent to 24,166. This was 34 percent below the total for 2014. Fifty-four of the 90 bankruptcy courts reported lower filings, and 32 districts had reductions of 20 percent or more (compared with 27 districts in 2017). The largest numeric decrease was a reduction of 806 filings (down 81 percent to 336) in the Eastern District of Virginia, which had reported an increase of 174 percent in 2017 that consisted mainly of filings related to a chapter 11 bankruptcy case filed by Health Diagnostics Laboratory, Inc.
Filings of adversary proceedings rose in 35 bankruptcy courts, with 19 districts registering gains of 20 percent or more (compared with 17 districts in 2017). The Southern District of New York reported the largest numeric growth, an increase of 400 filings (up 81 percent), with most arising from cases involving a chapter 11 bankruptcy filing in 2016 by SunEdison, Inc.
Terminations of adversary proceedings declined 11 percent to 25,850. Pending adversary proceedings dropped 6 percent to 24,357. Data on adversary proceedings in the bankruptcy courts can be found in Table F-8.